Peak 10, a national IT service provider, collaborated with leading analyst firm International Data Corporation (IDC) to discuss why they chose to deploy All-Flash Software-Defined Storage from Nexenta and SanDisk as well as the unique business benefits that a high performance SDS solution offered them. 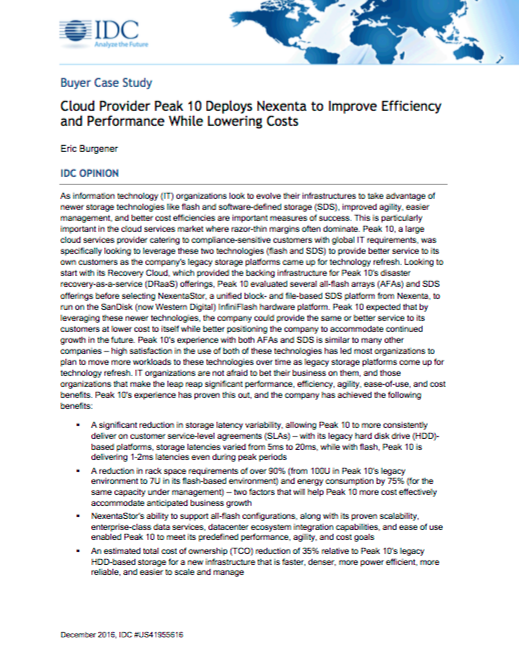 In this case study, you will learn how Peak 10 dramatically lowered their TCO, reduced storage latency, and significantly decreased their power consumption compared with their legacy system. Please fill-out the form below to receive your complimentary copy of the this IDC Buyers Guide.